I just got my scanner and wanted to send this photo out. It was taken, I believe, in Phu Bai 1. The corpsman's name is Hastings (1965/66). The Vietnamese is a medical student from Hue Medical School. 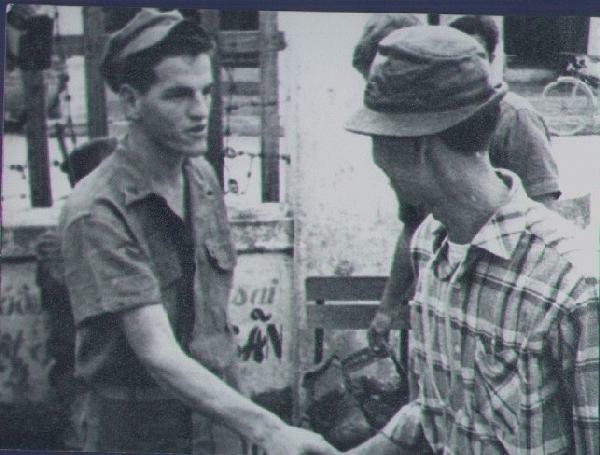 The People to People Program (later named Medcap, I think) brought medical students to the villages under the direction of Navy doctors and corpsman. This note was received from Richard Cavagnol, FO for the original CAC units in Phu Bai. While we cannot be 100% sure, "Doc" Hastings was probably working this early program in the villages. We would welcome any clarification of this. My recollection of the Med Cap program was that after we swept a village for VC and the bad guys taken away for questioning, we would then fly in several docs and corpsmen who would hold sick call for the village. Soap and other medications would be distributed, some of which wound up in Victor Charlie's pack. I have some shots of a Med Cap after a sweep west of Phu Bai in early 1966 that I will send to you as .GIF or .JPG files. I am sorry, I was not clear on the description of this photograph. The Corpsman in the photo is the CAC corpsman, I was the Medcap Corpsman. I only remember one of the doctor's name, Lt. Wells. There were several other Navy doctors present. This was one of my first Medcap experiences. Thanks to Richard for his comments.